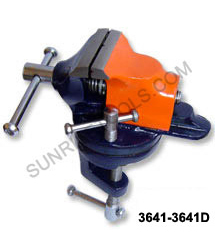 Description :-This hand vice is great for loads of uses in the jewelery making, watch making, model making etc. Serrated jaws open & close with large wing nut. Hollow handle accommodates even long wires. Jaws are smooth to prevent marring of soft metals. 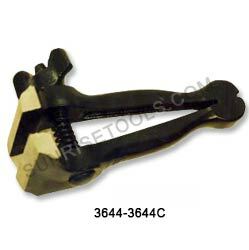 Description :-A lightweight vise mounted on wood handle. Jaws are smooth to prevent marring. 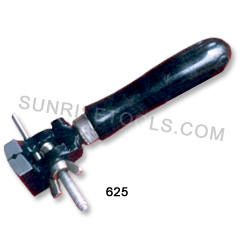 Use to hold small objects tight while grinding, drilling, filing, hammering, sanding, shaping, etc. 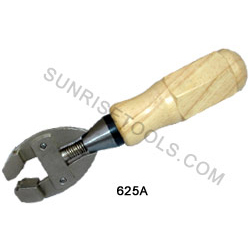 Description :-Simply turn the wood handle and the spring-loaded jaws open and close smoothly and precisely. Handle is hollow to enable you to hold long pieces of wire. Jaws are smooth to prevent marring. 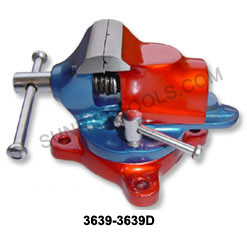 Description :-This hand vise is used for metal working, jewelers and hobbyists. 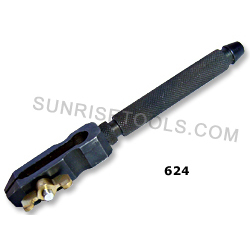 Made of forged, hardened tool steel. It has a spring action in the handle to keep the jaws open. 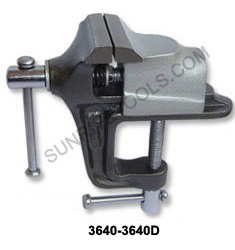 3644 Hand vice for jewelers 3"
3644A Hand vice for Jewelers 4"
3644B Hand Vice For Jewelers 5"
Description :-This hand vice is used for holding micro size parts firmly. One jaw has a vertical & horizontal slot to grip round items securely. 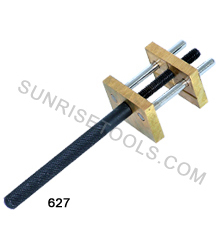 Solid brass jaws & polished steel guide pins for a positive grip. 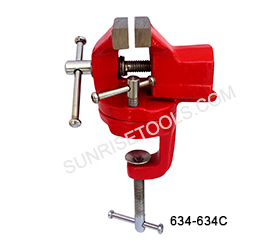 627 Hand vice made of brass and steel 5-1/2"
628 Hand vice made of brass and steel 5-1/2"
Description :-This Smart Vise firmly holds flat stock, coins and other small or thin materials. Fits onto bench or table with clamp or can be permanently attached to table with screws. Made of heavy spring steel for long life with leather-lined jaws for a non-marring grip. Lever allows the user to change directions quickly and effortlessly. 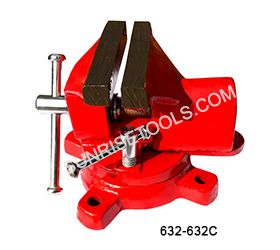 631A Table vice fixed base 2"
632 Table Vice Swivel Base 1-1/2"
Description :-This fixed base table vice made up of high quality material. 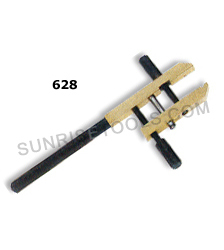 Also this is long lasting, smooth functioning and performs their tasks in a very effective manner. Suitable For Clamping To Any Workbench Or Table. 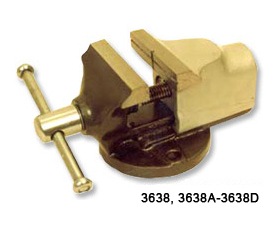 3638 Table vice fixed base 1-1/4"
3638A Table vice fixed base 1-1/2"
3638B Table vice fixed base 2 "
Description :-This is very useful for clamping and holding pieces from jewelry, hobbyists, crafts, watchmakers and model maker's pieces. The vice smoothly swivels around so you can get to all angles of your work. Jaws are smooth to reduce marking metals. 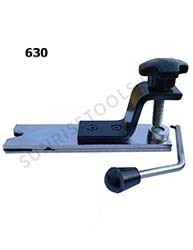 3639 Table vice swivel base 1-1/4"
3639A Table vice swivel base 1-1/2"
3639B Table vice swivel base 2"
Description :-This table vice clamp type easily mounts to your work bench and is perfect for small works such as crafts, jewelry, model building etc. Made of high quality material for long life with smooth jaws for a non-marring grip. 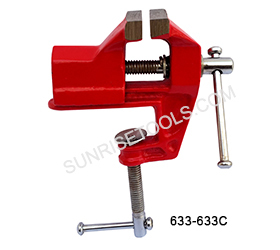 3640 Table vice clamp type fixed base 1-1/4"
3640A Table vice clamp type fixed base 1-1/2"
3640B Table vice clamp type fixed base 2"
3640D Table Vice Clamp Type Fixed Base 3"
Description :-This Table vice clamp type is convenient because it revolves. Jaws are wide and smooth for delicate work on soft metals. Constructed from high quality material for long life and durable. 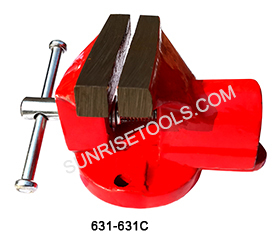 3641 Table vice clamp type revolving 1-1/4"
3641A Table vice clamp type revolving 1-1/2"
3641B Table vice clamp type revolving 2"
3641D Table Vice Clamp Type Revolving 3"